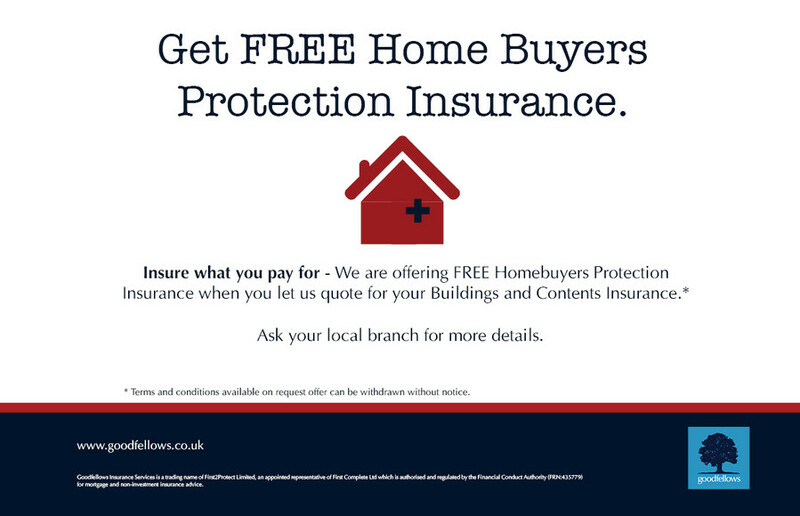 · FREE 'Home Buyers Protection Insurance' worth £49.99 to customers buying through Goodfellows. · Let us quote for your buildings and contents insurance and we will give you Home Buyers Protection Insurance for FREE. · The cover has to be activated within 14 days* of your conveyancer being instructed. Buying a home can be an expensive business and Goodfellows Insurance Services are offering free Home Buyers Protection Insurance. Sometimes buying a home doesn’t go completely smoothly. Occasionally due to circumstances beyond your control, a home purchase doesn’t proceed. Fees for mortgages, surveyors and solicitors can be many hundreds of pounds. Goodfellows will do everything possible to make sure your purchase goes through without any problems, but in the event that it falls through. Home Buyers Protection Insurance will cover you. This policy will let you claim some of the costs you have incurred in the event that your purchase does not complete. To qualify for this offer, let one of Goodfellows Insurance Services specialists provide you with contents and buildings insurance with no obligation. We have access to many exclusive options which are not available to the general public on comparison websites. You are under no obligation to take out the buildings or contents insurance – the free Home Buyers Protection Insurance will be yours either way. When might a sale not proceed? Around a fifth of property transactions fall through due to gazumping, seller withdrawal, adverse property survey or a down valuation – all of these reasons are covered by the Home Buyers Protection Insurance. Terms & conditions apply. This information is a summary only. You will receive a full policy document upon application. This policy will set out the terms, conditions and limitations of cover provided under the plan. Offer available until further notice.